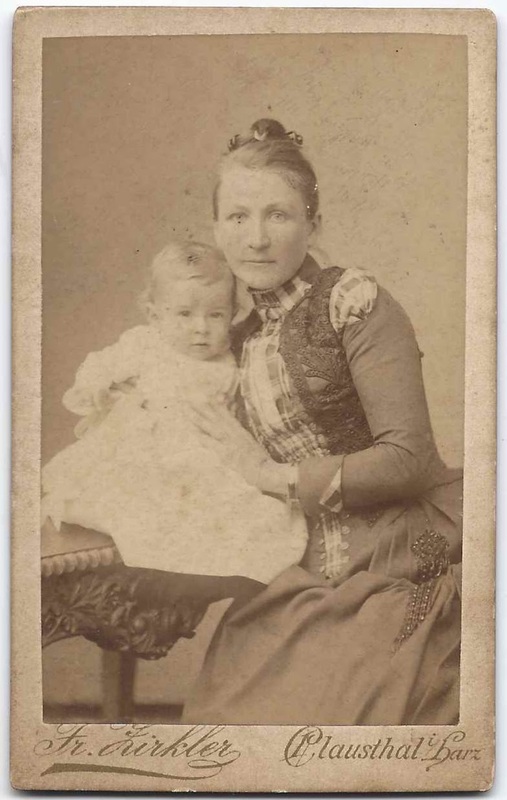 Carte de visite of a lovely mother and child, taken by the studio of Fr. Zirkler, Clausthal i Harz, with interesting text in German on the reverse. 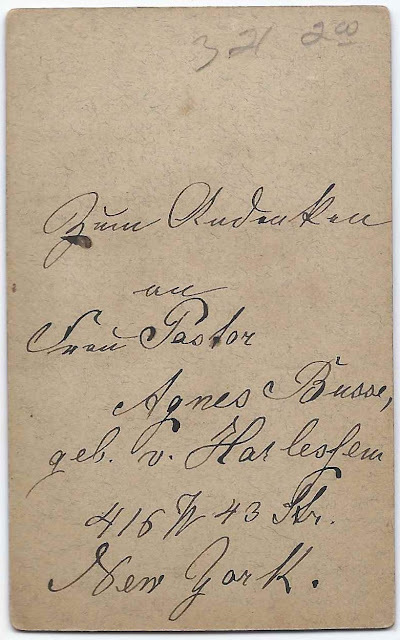 Thanks to the help of people far and wide, I've learned that the text translates in English to something like "In Memory of Frau Pastor, Agnes Busse, born von Harlessem, 416 W. 43rd Str., New York." One collaborator found an article in the New York Times issue of September 4, 1888, detailing the marriage of Agnes von Harlessem to widower Rev. George Frederic Wilhelm Busse, pastor of St. Luke's Lutheran Church, 42 Second Street, New York, New York. Agnes, described as beautiful and charming, was a German baroness, daughter of Rudolph Harlessem, and of one of the oldest families of Hanover, Germany. Most records show that Pastor Busse went mainly by William or Wilhelm. The St. Luke's Lutheran Church website indicates that Rev. William Busse was called to the ministry of that church from Poughkeepsie, New York, in 1874. Another collaborator found a birth record for Clara Gertrude M. E. C. Busse, born 3 August 1894 at Manhattan, daughter of Wilhelm and Agnes (von Harlessem) Busse. Perhaps the child in her mother's arms is Clara, and the photograph was taken while on a trip back to Germany, as a New York Passenger list record shows that Agnes and her children returned to New York on 3 October 1895 after sailing from Bremen, German. I found a birth record for a son [?] named Agnes von Harlessem Busse, born 5 August 1891. And I found a New York City death record for an Agnes Busse on 13 January 1893, but that child was 6 months old, unless the age was written or indexed in error. If this is the same child, it's possible that mother Agnes also took her [?] to Germany to meet relatives, and the child died at some point after their return. So it's possible that the child in the photograph is daughter Agnes. A history of St. Luke's Lutheran Church has several paragraphs about the death of Rev. Busse. He died 12 November 1899 and was buried in the Lutheran Cemetery, where it's mentioned that his mother, first wife and four children "had previously been laid to rest." How sad. The 1900 Census of New York shows widowed Agnes with children Griso, age 10, born about May 1890; Rudolph, age 8, born about May 1892, and Clara, then 5, born May 1895, though we know from the birth record that Clara's birth date was May 1894. The child in the photograph could also be Griso or Rudolph. Hopefully a reader has further information on the Busse and von Harlessem families that sheds light on the photograph, especially if the mother and child in the photograph are not Agnes and her child but rather are relatives or friends. Another mystery: how did this CDV find its way to Maine?